Now, you can even show your support for Autism Awareness when you travel! Our colorful and bold luggage tag will make a great Autism Awareness gift for friends and family members who have a loved one with autism. The personalized touch makes this luggage tag even more special. This Autism Awareness design is printed on both sides of our single plastic luggage tag and measures 4" h x 2.75" w. It includes a clear elastic loop for easy luggage identification. Free personalization of any name is included. 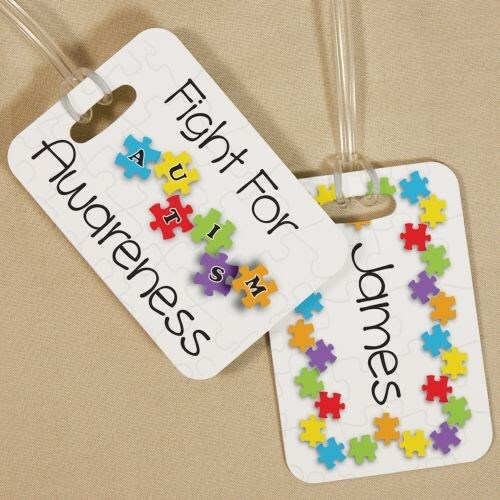 Additional Info You can educate others about the complex autism spectrum on the go when you have these colorful luggage tags traveling with you. Check out other Autism gifts and our Autism Awareness Apparel that will help you spread your message. Together, we can piece together the complex autism spectrum and make others more aware.